You have the opportunity to live in one of the most culturally rich areas of China, with Suzhou’s UNESCO World Heritage gardens and canals famous around the world. Suzhou combines its rich 2,500-year-old history with a drive to become one of the most modern cities in China. It has a population of more than six million and a GDP of a trillion RMB – far larger than those of many entire countries! The entertainment guide That's Suzhou has a wealth of information on restaurants, bars, events, and local news. Suzhou has a history of more than 2,500 years and is one of the oldest towns in the Yangtze Basin area. It was originally settled by local tribes who named themselves the Gou Wu and who formed settlements on the edges of hills above the wetlands around Lake Tai, a large lake located west of Suzhou. The capital of the Wu was located within modern-day Suzhou and was known as Gusu. In 514 BC King Helü of the Wu established his new capital nearby at Helü City which grew into present-day Suzhou. In 496 BC, King Helü was buried at Tiger Hill, now a popular tourist attraction. Remnants of this culture can be found at Pan Gate, which features the remainders of a 2,500-year-old city wall. Since the Song Dynasty (960-1279), the city has been an important centre for China's silk industry. The explorer Marco Polo once described Suzhou as the "Venice of the East". Upon completion of China’s Grand Canal, Suzhou was strategically located on a major trade route. Throughout the course of the Chinese history, it has been a metropolis of industry and commerce. Today, the city's canals, stone bridges, pagodas, and meticulously designed gardens have contributed to its status as one of the top tourist attractions in China. The classical gardens in Suzhou were added to the list of the UNESCO World Heritage Sites in 1997 and 2000. Suzhou is located in the southeast of Jiangsu Province in eastern China. 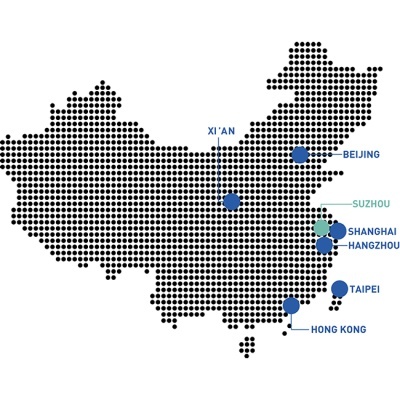 Within Suzhou is Suzhou Industrial Park, one of the most competitive development zones in China. This area also contains the Suzhou Dushu Lake Science and Education Innovation District (home to XJTLU), which sits beside Dushu Lake, one of two lakes in SIP. Central Shanghai can be reached from Suzhou in just 30 minutes by high-speed train. There are lots of things to do and places to shop in Suzhou with some of the city’s main entertainment and shopping hubs located around the scenic Jinji Lake, near the University. Many museums and galleries in Suzhou are well worth a visit. One of the most popular is the Suzhou Museum designed by world famous architect I.M.Pei. Food lovers won’t be disappointed by Suzhou's huge variety of restaurants, while the city's nightlife offers a range of options for those who love to socialise.